She created the definitive image of the mysterious gothic lady in the spooky house. 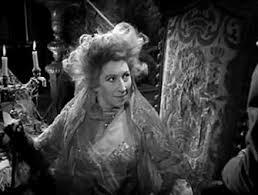 Her striking features and commanding stage presence made her perfect for the role of Miss Havisham in the 1946 movie Great Expectations. She was a British actress named Martita Hunt. Hunt was born of British parents in Argentina in 1899 and lived there until she was 21 years old when the family moved back to Britain. That move must have been a wrenching experience for the young Martita – to leave behind forever a place and people where you have grown up. I believe that when the ship sailed out of Buenos Aires harbor in 1920 carrying Martita and her family to England, it left the real Martita behind. In England, a foreign country for her, she was likely very lonely at boarding school in Sussex, so quickly embarked on an acting career that allowed her to hide behind a series of characters on stage and screen. She worked as an actress almost continuously until her death in 1969. She never married and left no legacy. No biography was written about her life. So for us she remains always, Miss Havisham, inhabiting a place where time has stopped. I think Martita would like that.